Could Jesus Have Been a Shipbuilder? The first minute and a half or so of this clip from The Passion of the Christ is one of the most heartwarming of the entire film (mind you, this is not exactly a cuddly film). But how accurate is it? Recently, there has been a lot of controversy online about the “masculine nature” of Christianity. It was sparked by some comments made by John Piper, answered by anyone and everyone on the blogosphere and then revisited ad nauseum ad infinitum (over and over until you get sick). I’m not going anywhere near that discussion, but one of the points made by one of the bloggers was that “Jesus worked a real job as a carpenter.” This has always been one of those points in the Jesus narrative in which commenters seem to expand and expand an idea from very little Scriptural support. That’s it. Out of these two references, we have build up an entire mythology about Jesus working as a lowly carpenter in some backwater town. But is our image of the carpenter even correct? The Greek word is τέκτων (TEK-tōn), and it does not mean a carpenter as in someone who builds tables. It literally means “the builder” and it represents something of an artisan caste. In the Greek Septuagint (translation of the Hebrew Scriptures), it is used to translate the word הרש (harsh) for artisans of all kinds – not just woodworkers but also jewelers (Exodus 28:11) and metalworkers (1 Samuel 13:19). To me at least, there seems to be something much more than just a guy banging together wooden structures in this word. Joseph’s profession was not just someone eking out a living. There was an art to his work. I looked through some other writings in Greek trying to find out if a tekton might be involved in the building of ships, but I couldn’t find anything – not yet at least. I’m going to keep looking. Today, when we think of a carpenter, we think of someone who builds houses. Since Jesus was a carpenter in Galilee, I lean toward thinking that either he was involved in the construction of cities – like Sepphoris or Tiberias – or in the construction of the fishermen’s boats. This type of construction would have required skilled woodworking. This was not something the fishermen themselves would have built. 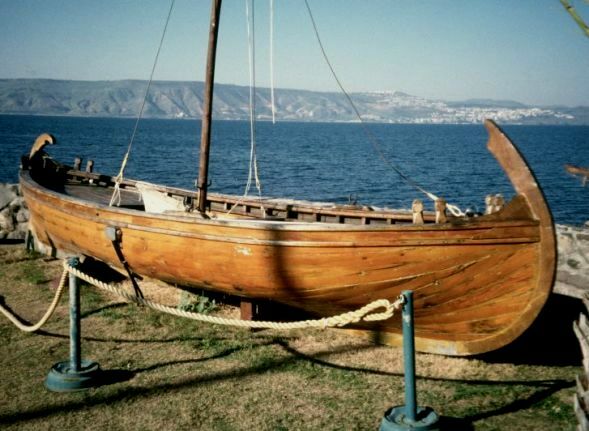 Could Jesus have worked as a shipbuilder for the Galilean fishermen? Was that why he knew so much about their trade? Was that why although Nazareth was his hometown (located a few miles from the lake), he had been gone for most of his adult life? There simply isn’t enough evidence to know for sure, but he certainly did seem to be very connected with the fishing industry. It is certainly food for thought. But more importantly, just the possibility shows how easy it is for us to put Jesus in our own context, to think of him as we have been told to think about him rather than to truly explore the resources at hand. Previous postThe Spotlight Is On You! It would then be a sensible conclusion that Jesus (or at the least Joseph) has business with the fishermen disciples (or at least their fathers) and maybe even built a boat or two for them. I think at least one of the gospel’s suggests that Jesus had some kind of prior relationship to them anyway. It would make it a whole lot less crazy of them to drop their livelihood and follow Jesus, having a previously existing relationship with Jesus. Particularly so at the beginning of his ministry when word of Jesus’ power was not widely spread. I have to dig around again and find my notes, but I once did a study on the disciples and I found that a majority of them were related and that at least two of them may have been Jesus’ cousins.